Pakistan opened the border on Tuesday for two days at Torkham in Khyber tribal region and Chaman in Balochistan province which are the most popular routes to travel to Afghanistan. 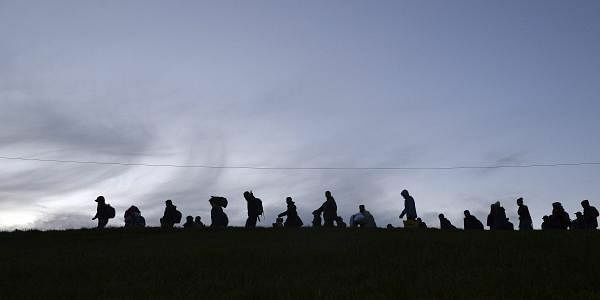 ISLAMANAD: More than 51,000 Afghans and 2,700 Pakistanis crossed to their respective countries in two-days after Pakistan temporarily opened the Afghan border which was closed last month after a string of militant attacks. Over 32,000 Afghans and 2,700 Pakistanis crossed into their respective countries via the Torkham and Chaman crossing points yesterday, the last day of reopening of the border, Dawn reported. "In two days, over 51,000 Afghans and 4,900 Pakistanis returned to their respective countries after the Pakistan government reopened the border crossings on Tuesday," the report said. At Torkham, the Frontier Corps in collaboration with the political administration made elaborate security and immigration arrangements in order to facilitate swift and speedy return of Afghans and also to avoid the situation when the frustrated people on Tuesday broke security barriers and crushed to death an Afghan woman in their desperation to cross the border. Female paramilitary Frontier Corps (FC) personnel were also deputed at the border to help guide returning Afghan women and their children. According to officials, 11,500 Afghans crossed the border yesterday and 12,539 on Tuesday. About 700 Pakistanis returned home in two days. The Afghans waiting in long queues at the Torkham crossing expressed mixed feelings about reopening of the border and their return journey. Amanullah of Jalalabad said that though he was happy to go back home after 18 days of painful wait, the Pakistan government's decision to close the border again was even more painful for most of his countrymen. According to officials, 20,870 Afghans crossed into their country, while 2,631 Pakistanis returned home via the Chaman border crossing. In two days, 27,718 Afghans went back to Afghanistan and 4,277 Pakistanis returned to Chaman. The border was again closed indefinitely. "We have closed the border again for an indefinite period," a senior security official said, adding that he was not aware when it would reopen. The Pakistan government had decided to close the border last month amid a string of deadly militant attacks, that killed more than 125 people, which the military claimed were carried out by militants operating from safe-havens in Afghanistan. The two countries have long accused each other of failing to combat extremists who operate along their porous frontier.